Welcome! Please browse our site if you are new to Montessori or are looking for an opportunity to continue your child’s Montessori experience in one of our pre-school, extended-day (full day kindergarten) or elementary settings. We are situated in the heart of South Vancouver, near the intersection of Granville St. and West 70th Ave., and just a short walk from beautiful Fraser River Park. Our pre-school classes offer half-day programs in the morning and afternoon and are licensed by Community Care Facilities Licensing. We also provide full day (extended-day) programs for our 5 year old children. Our elementary classes offer fully integrated educational programs for children aged 6 to 12. Our extended-day and elementary programs are certified (Group 1) by the B.C. Ministry of Education, Office of the Inspector of Independent Schools. 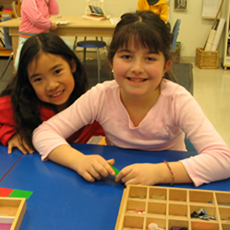 All of our classrooms are guided by fully trained Montessori teachers. Maria Montessori saw the child and the family in a very universal sense- the microcosm within the macrocosm. She realised that in an environment of love and respect the child was actually creating him/herself and fulfilling true potential. She observed that when the child is allowed to Do, to Act, and to Become with love, respect and discipline (first by parents, then individually), the child then treats others with the same respect and love- allowing them also to Do, to Act and Become. Members of a family learn from one another; the parents allow and encourage the growth of the child and thus experience themselves growth and development. As the family functions harmoniously in the community, it affects the surrounding society and finally, all of humanity. Gradually the world becomes the ideal place Montessori saw possible- free from war and the poverties of mind, body and spirit. Montessori education in the classroom is a continuation and reflection of the parent’s encouragement of growth- allowing the child to learn at his/her pace by filling the environment with specific materials for the child’s eager hands to discover therein. Montessori felt that the child “absorbs” from birth through six, all within his/her environment. The Montessori classroom thus provides the areas of practical life, sensorial, language, math and cultural studies for the child to satisfy these tendencies. Then, as the “rational mind” begins functioning from ages 6 to 12, the child can learn many facts abstractly- gaining a truly Montessori “cosmic education” of how our Earth was formed and the different areas of study that arise from humanity’s observation of the Earth (geology, botany, zoology) and it’s cultures (art, history, music, civilizations, etc.). Maria Montessori envisioned a peaceful and dynamic world where all growth- physical, emotional, social, mental and spiritual- could proceed according to each individual’s and family’s needs to the benefit of all humanity. Maria Montessori felt the child truly holds the Key to Peace on our planet. The parents of Vancouver Montessori School have continued to be its strength through various events that have been widely supported each year- fundraising raffles, Friday pizza-days, car-pooling, and our most valuable volunteer Safety Parking Patrol. All of us at Vancouver Montessori School deeply appreciate the efforts of our parents.